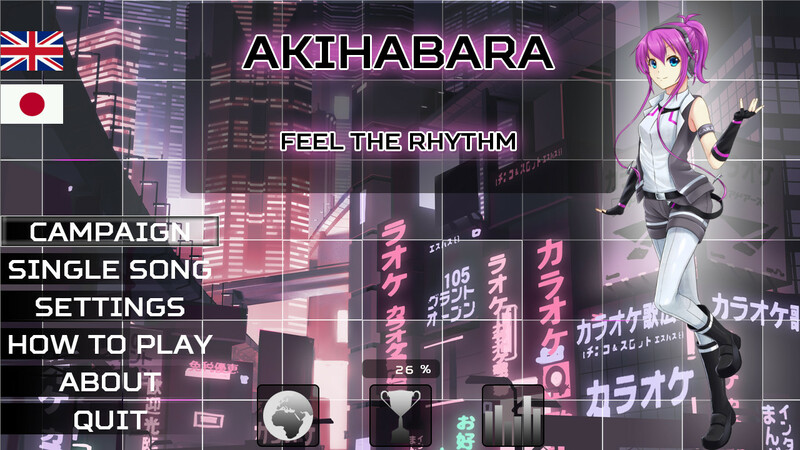 I will admit I was quite interested in reviewing Akihabara ~ Feel the Rhythm~ when the opportunity came up, as rhythm games have become one of my favorite genres in recent years. This title is a tribute by the developer, JMJ Interactive, towards the famous Tokyo district of the same name. It is always a nice thought when a developer decides to pay tribute to something, even if the finished product doesn’t quite work out, which is what has happened here. The title screen. This background is the best one in the game. 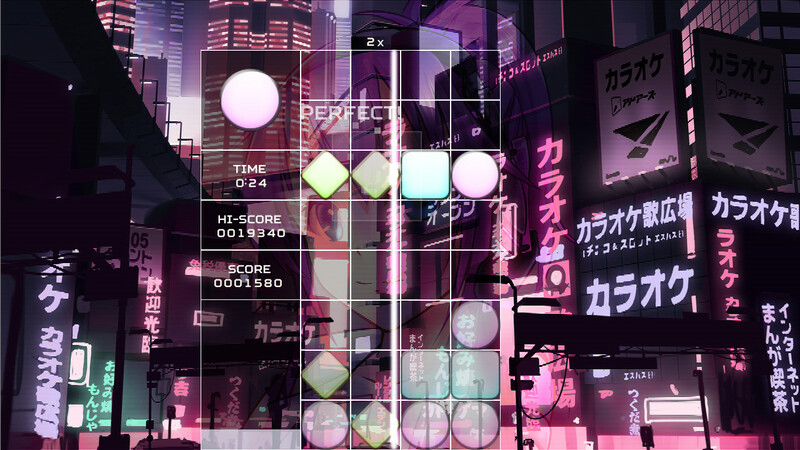 Akihabara is a unique game in that it combines two genres together; the rhythm action genre and the match 3 puzzle genres. How this game works is simple; as the song plays your objective is to match up a number of tiles alongside each other without one of the columns filling up to the top. You can change one tile’s shape at a time allowing you to alter one of the various shapes in front of you in order to complete this objective. 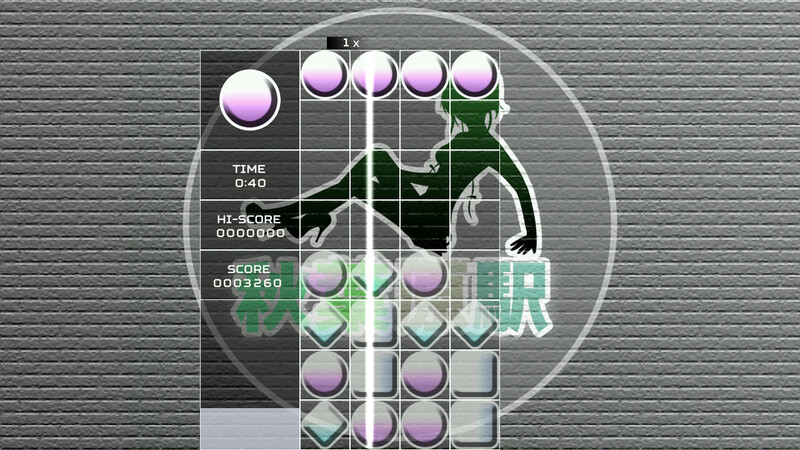 The rhythm action part comes down more to point bonuses, where if you change one shape/tile per beat the multiplier bonus increases and you earn more points per set of blocks removed. However, this will reset if you don’t keep up tapping to the rhythm. 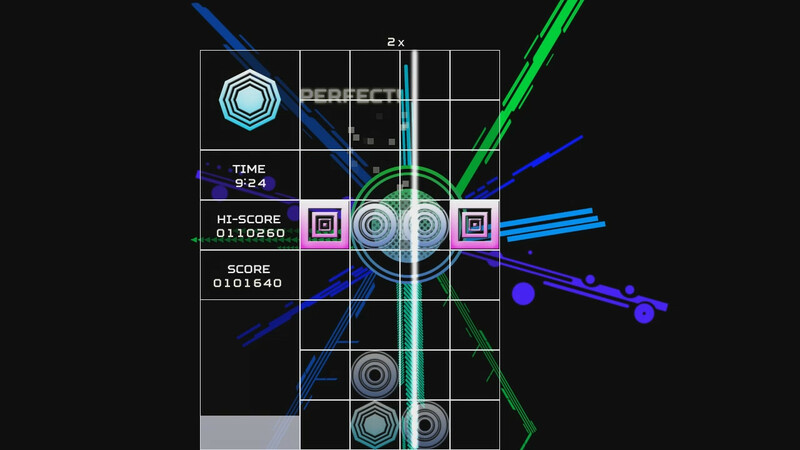 The problem with this at the end of the day is that the match 3 tasks take priority over these multiplier bonuses, and given the challenging difficulty in the medium and high levels, you are likely to find yourself ignoring the rhythm aspect and instead focusing on the match 3 elements. If you get a game over (i.e. filling a column full of tiles), in the Campaign Mode you will lose at least 10,000 points with the option to continue. However, in the Midnight Mix Mode you will get an immediate ‘game over’ with no option to continue. Also worth noting is that in these two modes, the Campaign Mode consists of a chain of 10 songs in a row (meaning about half an hour of game time) and the Midnight Mix Mode is half of this, presumably to compensate for the lack of ability to continue if you get a game over. One of the more ‘meh’ art styles. I really didn’t like the transitions between each song during the chained modes. I found the music in Akihabara to be quite forgettable. While there are some decent tunes, I didn’t remember the majority of the soundtrack afterwards which is disappointing. I think part of the reason why is because trance music isn’t my forte, and the midnight remixes in particular are slower and not very interesting. There are also only 16 tracks in the game, which means the track selection is fairly limited, meaning if you don’t gel with the OST in this game, this title may not be for you. A sample video on YouTube has been released of the soundtrack, which I have linked here. I would consider listening to the samples before deciding whether this soundtrack appeals to you. Gangster art on a budget. The visuals are also a mixed bag. While the first song’s graphic sets are well done, the visuals for the rest vary wildly in quality, ranging from decent to jarring and borderline ugly. This is mainly due to the palette choice of the various color schemes used, and it looks bad. There is also the character portrait of Cailie, though Cailie acts more like a mascot than anything else, since there is no character development whatsoever. That said, the mascot drawings are well done and add an extra layer of personality, albeit wafer thin. Furthermore, the font used for the Japanese text is unfitting in comparison to the English text. Yes, in this game there is actually Japanese text that you can switch to from the English text. I would wager this is an attempt to court Japanese speakers or learners (though I can’t imagine many Japanese PC gamers using Steam, but I digress), but it’s a nice inclusion nonetheless. This looks absolutely beautiful. It’s the first song you play, so at least you’re more likely to see it the most. To conclude, Akihabara ~ Feel the Rhythm ~ very much feels like a product designed to test the waters on a concept. The playtime is only a few hours to check out everything and the music and visuals aren’t anything special. However, the underpinning gameplay has potential and I’d be interested in seeing the direction the developers take, seeing as they are already promising extra content at the time of this review. At the moment, there are only the two modes outlined earlier alongside the “Single Song” mode, allowing you to replay the songs you’ve already done one at a time. In that sense, it may be worth holding on to your money until Akihabara is a more fleshed out product, because at the moment the game is just average and probably not worth £4.99 ($6.99) at this point in time. That said, the concept that has been shown here is promising and as a tribute product, it’s not half bad.